We are delighted to introduce you to the hosts of our 7 day straw bale Rogersville, MO workshop coming up May 30-June 5, 2016. This beautiful family is so dynamic, gracious, loving, and kind that we are thrilled they are hosting our midwest location! To say that they are used to large groups is a mega understatement. Inna and Val both come from large Russian families and though Val’s family is based in Seattle, Inna’s lives in the same area as her and her parents, and get togethers are huge. 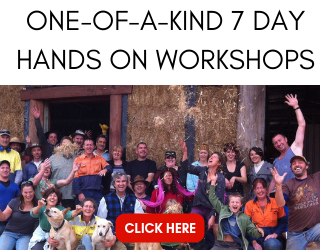 They are consummate hosts and anyone that attends this workshop is up for a very special experience. Hi my name is Inna and my husband’s name is Val. We have 4 children. Stephen is 17, Nickolas is 15, Stella is 8, and Ruben is 4. Val and I both have lots and lots of extended family, all of his are in Seattle area and most of mine here in Missouri. We are all about family here and are very close with our bothers and sisters. Our kids are also very close to all their cousins. We bought 20 acres 10 years ago and gave 10 to my parents. They built a traditional construction home on it about 2 years ago. Val and I are building a straw bale home on this land for our family. A few miles away is another 40 acres that my brother and 2 of my sisters built their homes on. About a year ago, we learned that Val has a rare cancer, called Squamis Thymic Carcinoma. In the past year he has had open heart surgery to remove the growth and has also had chemotherapy. We also tried everything possible naturally in this last year, from juicing every hour to only eating raw, vegan, and gluten free. He is now on chemo and we are praying for God’s divine healing. We want this straw bale home more than ever because we want to lower our bills so we can spend more time with each other. We really appreciate every person coming out and helping us get to our dream faster! 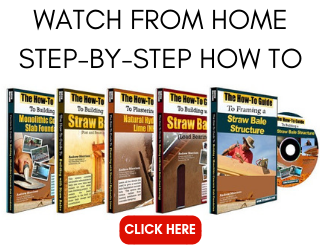 I saw information on straw bale construction online about 3 years ago when I was researching green home construction and really got interested. We really want to have a home with minimum bills. We are thinking of putting solar on the home as well. I love the aesthetics of a straw bale home and the thick walls which can create window nooks for reading or napping in. In terms of the workshop location, we have 20 beautiful rolling acres between us and my parents’ house. There is plenty of room for tents and campers. We even have a camper that fits 6 people if some people would like to use it. We will have a porta potty on site as well as real showers in my parents’ house for anyone to use. We will have lots of food and amazing options from Russian home made borsh and peroshkies to salads and other vegetarian options, to sandwiches and burgers. No one will go hungry with my mom and aunt in the kitchen! We will always have great homemade desert and cakes. Something at every meal. We are also planning on having nightly campfires for hanging out by and if anyone wants to hang out and watch TV at my mom’s house, that will also be available because everyone winds down differently. We are all very excited to meet everyone and to get to see our little bale home go up. We look forward to learning a lot from Andrew and also to meet all the amazing people coming to help us with our home! This sounds like it will be a fantastic workshop. I will love to see the progress photos. Enjoy your bale raising! Wow, what a beautiful family and a touching story. My name is Kerry and I’m from St. Louis. I’m seriously thinking about building my own straw bale home for my 8 yr old son George and me. I would love to bring him to the workshop and teach him some valuable lessons about teamwork, cooperation and helping others. I think this would be an amazing experience for anyone. Hi Kerry. I hope you can both join us in Missouri. I agree that it would be a great experience for him. 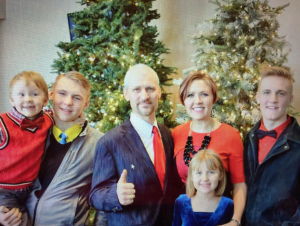 This is such a courageous family! I love that they have decided to continue to live life fully and follow their dreams. I hope for the best for them as they work together to beat the cancer. I was just thinking that if they’re not already continuing with the raw vegan diet, I encourage them to – if it can be managed while the father, Val, is undergoing chemotherapy. There is so much diabetes and stress related high blood pressure in my immediate and extended family, amongst other health issues. So, when I started seeing signs of pre-diabetes, I got scared and made the decision to eat better and exercise more. It made a big difference. Yet, it wasn’t until I tried raw vegan eating for a few months that I saw an almost miraculous turn-around, and not just with the pre-diabetes, but with my entire overall health. My daughter and I have eaten a vegan diet for about 14 years, for both non-health and health related reasons, but eating a vegan diet of raw food put my health at a whole other level. My daughter said she felt better and way less tired as well. That said, I do enjoy cooked food, especially my baked treats and family holiday meals. So, while we now eat much more raw fruit and vegetables, we’re still only about 30-40% raw vegan. I think it needs to be closer to an 90-100% (*80-10-10) raw diet to experience the kind of health and well-being I did during the months I ate 100% raw. I’m working towards eating a raw vegan diet everyday, except maybe on special occasions and holidays. I think there is a much stronger link to how we eat and our health than many of us are taught. 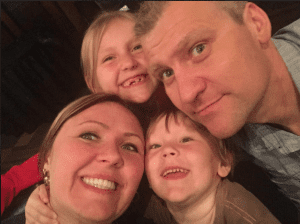 Kudos to this family for starting with diet first, and I hope they can continue eating raw vegan – and organic. I really believe many illnesses we develop today are the result of our modern diet. I’d just love for them to beat this. Whatever other paths to health and curing the cancer they choose along with the chemotherapy, I wish Inna, Val, Stephen, Nickolas, Stella, and Ruben, the very best. *80-10-10 or 811 refers to a raw vegan diet of 80% fruit, all kinds, 10% vegetables, mostly dark leafy greens, and 10% nuts and seeds – all organic, if possible. Sometimes it’s helpful to see what others are doing to get more ideas. I started out trying to prepare the raw vegan recipes I saw online and in cookbooks I purchased, but for me eating more simply ultimately worked out better. I do a bit more than 10% for greens, but this is what a sample meal day looked like for me: breakfast of a fruit & nut bowl of 3-5 apples, washed, cored, and cut into chunks, 1/2 cup frozen berries, 1/2 cup walnuts, and 1/4 cup raisins all tossed together, for lunch, 5-6 pieces of fruit, and 1/2 cup of nuts and seeds, and for dinner, a large salad of mostly greens, like spinach, kale or collards, red leaf, green curly leaf, and romaine lettuces, carrots, red onion, radishes, yellow bellpepper, maybe 1-2 other vegetables, and 1/4 cup raw sunflower seeds, all tossed with balsamic vinegar, olive oil, and a couple of pinches of sea salt. I drank water as I needed it. Note: The breakfast fruit & nut bowl and dinner salad were prepared in extra-large stainless steel mixing bowls, for a one-person meal. I found you have to make sure you eat enough food when eating a raw vegan diet or you’ll lose too much weight too fast – and that’s not good, even if weight loss is the goal. I was biking close to a 20 mile round-trip to and from work, and started losing weight really fast, so I increased my food intake till the weight loss slowed down. I was still loosing about 2-4 lbs per month. So, just gauge your food intake by your personal metabolism and activity level. With chemotherapy, holding food down may be difficult, at best, but if you’re continuing with the raw vegan diet, and Val is able to manage it, I hope my experince with it helps a little. Best wishes! My apologies for the super long posts. Since we have so many people with illnesses in my family, health and diet is big for me. Thank you for your concern and advice. I know that the hosts have worked very hard through all angels, including diet, to defeat the illness. I appreciate your care in offering them your best. 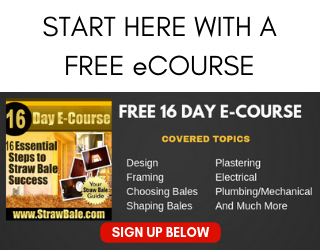 This will be our second straw bale construction experience. We attended the Lincoln Nebraska workshop last year and had an amazing week – new friendships and memories for a lifetime. Looking forward to meeting you and helping build your new home. And I get the lucky opportunity to spend another week with two amazing people!!! God heals all sorts of hurts. I pray He heals your cancer. Great story! All signed up, ready to build! WooHoo! See you very soon!! !